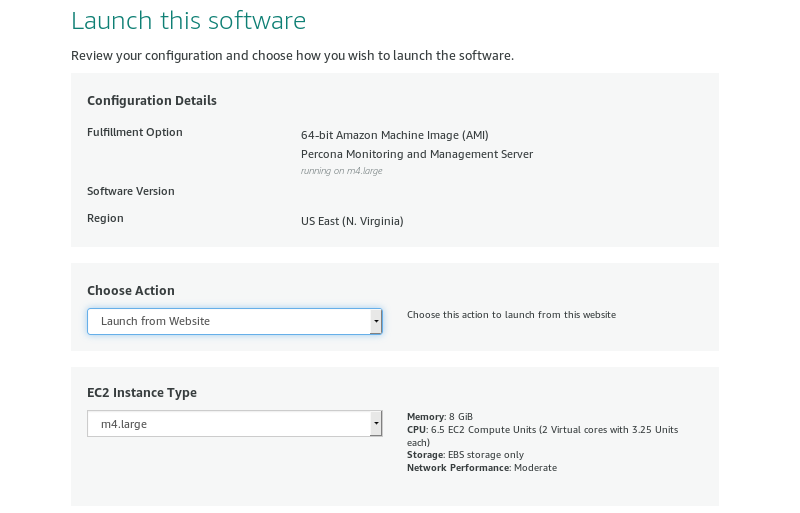 You can run an instance of PMM Server hosted at AWS Marketplace. This method replaces the outdated method where you would have to accessing an AMI (Amazon Machine Image) by using its ID, different for each region. The home page of PMM in AWS Marketplace. Assuming that you have an AWS (Amazon Web Services) account, locate Percona Monitoring and Management Server in AWS Marketplace. The Pricing Information section allows to select your region and choose an instance type in the table that shows the pricing for the software and infrastructure hosted in the region you have selected (the recommended EC2 instance type is preselected for you). Note that actual choice will be done later, and this table serves the information purposes, to plan costs. 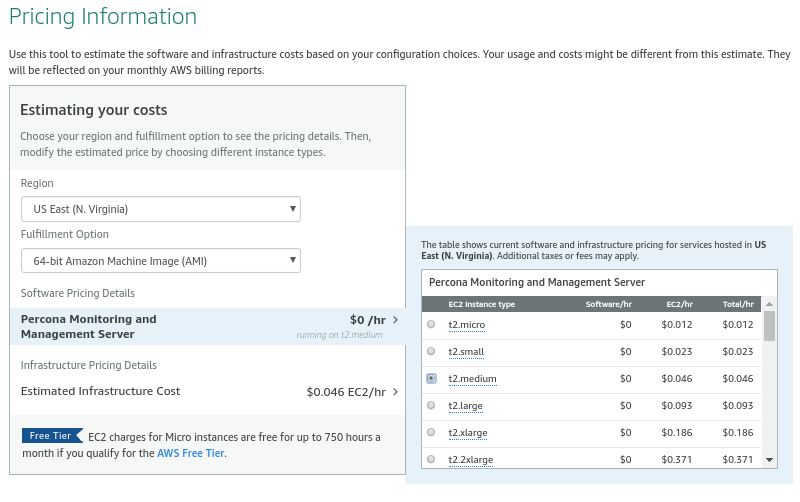 As soon as you select your region, you can choose the EC2 instance in it and see its price. PMM comes for no cost, you may only need to pay for the infrastructure provided by Amazon. Disk space consumed by PMM Server depends on the number of hosts under monitoring. Each environment will be unique, however consider modeling your data consumption based on PMM Demo web site, which consumes ~230MB/host/day, or ~6.9GB/host at the default 30 day retention period. See this blog post for more details. Clicking the Continue to Subscribe button will proceed to the terms and conditions page. Clicking Continue to Configuration there will bring a new page to start setting up your instance. 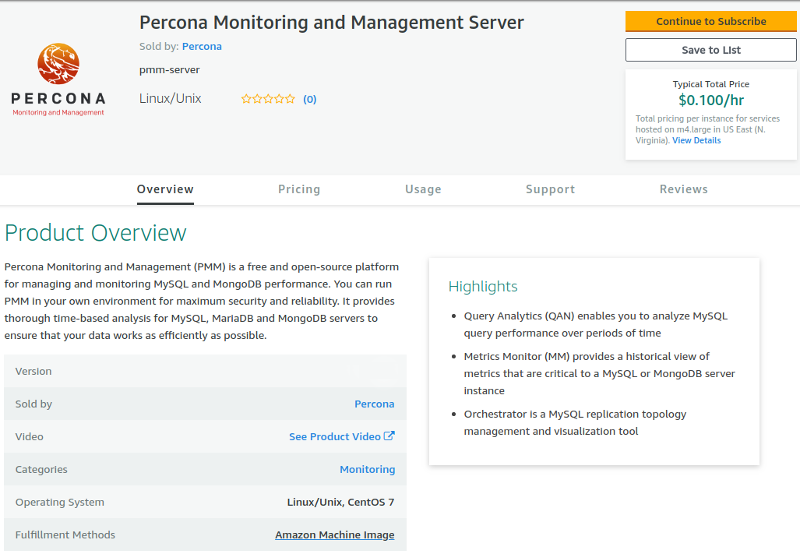 Percona Monitoring and Management on AWS Marketplace - launch options. Available launch options in the drop-down menu include Launch from Website and Launch through EC2. The first one is a quick way to make your instance ready. For more control, use the Manual Launch through EC2 option. Choose Launch from Website option, your region, and the EC2 instance type on the launch options page. On the previous screenshot, we use the US East (N. Virginia) region and the EC2 Instance Type named m4.large. To reduce cost, you need to choose the region closest to your location. When all choices are done, click the Continue to Launch button to proceed. vpc-484bb12f. The exact name of VPC may be different from the example discussed here. Select VPC in the VPC Settings section. Instead of a VPC (virtual private cloud) you may choose the EC2 Classic (no VPC) option and use a public cloud. Selecting a subnet, you effectively choose an availability zone in the selected region. We recommend that you choose the availability zone where your RDS is located. Note that the cost estimation is automatically updated based on your choice. In the Security Group section, which acts like a firewall, you may use the preselected option Create new based on seller settings to create a security group with recommended settings. In the Key Pair select an already set up EC2 key pair to limit access to your instance. It is important that the security group allow communication via the the following ports: 22, 80, and 443. PMM should also be able to access port 3306 on the RDS that uses the instance. 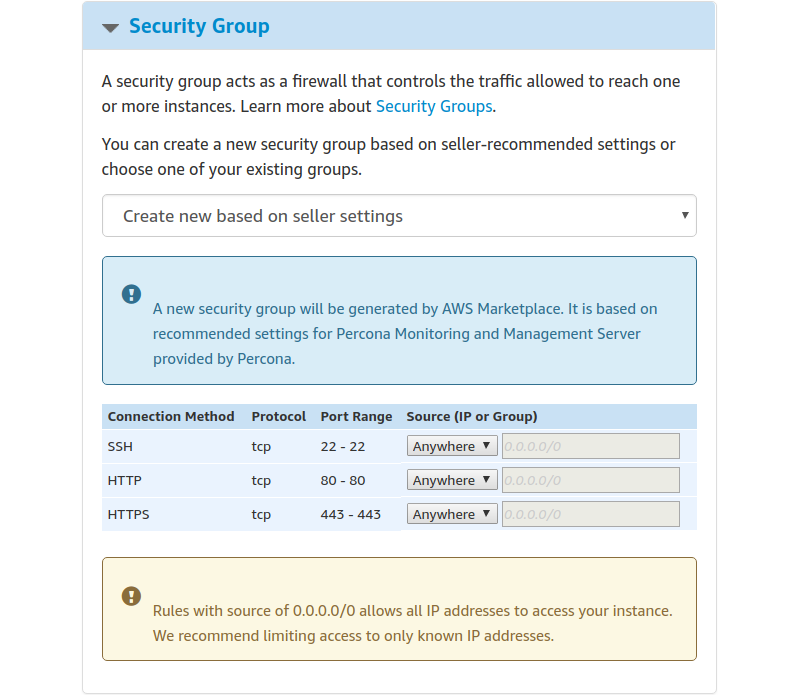 Select a security group which manages firewall settings. Scroll up to the top of the page to view your settings. Then, click the Launch with 1 click button to continue and adjust your settings in the EC2 console. Your instance settings are summarized in a special area. Click the Launch with 1 click button to continue. The Launch with 1 click button may alternatively be titled as Accept Software Terms & Launch with 1-Click. Your clicking the Launch with 1 click button, deploys your instance. To continue setting up your instance, run the EC2 console. It is available as a link at the top of the page that opens after you click the Launch with 1 click button. Your instance appears in the EC2 console in a table that lists all instances available to you. When a new instance is only created, it has no name. Make sure that you give it a name to distinguish from other instances managed via the EC2 console. The newly created instance selected. After you add your new instance it will take some time to initialize it. When the AWS console reports that the instance is now in a running state, you many continue with configuration of PMM Server. When started the next time after rebooting, your instance may acquire another IP address. You may choose to set up an elastic IP to avoid this problem. With your instance selected, open its IP address in a web browser. The IP address appears in the IPv4 Public IP column or as value of the Public IP field at the top of the Properties panel. To run the instance, copy and paste its public IP address to the location bar of your browser. In the Percona Monitoring and Management welcome page that opens, enter the instance ID. You can copy the instance ID from the Properties panel of your instance, select the Description tab back in the EC2 console. Click the Copy button next to the Instance ID field. This button appears as soon as you hover the cursor of your mouse over the ID. Hover the cursor over the instance ID for the Copy button to appear. Paste the instance in the Instance ID field of the Percona Monitoring and Management welcome page and click Submit. Click Submit and enter your user name and password in the dialog window that pops up. The PMM Server is now ready and the home page opens. Create credentials for your instance. 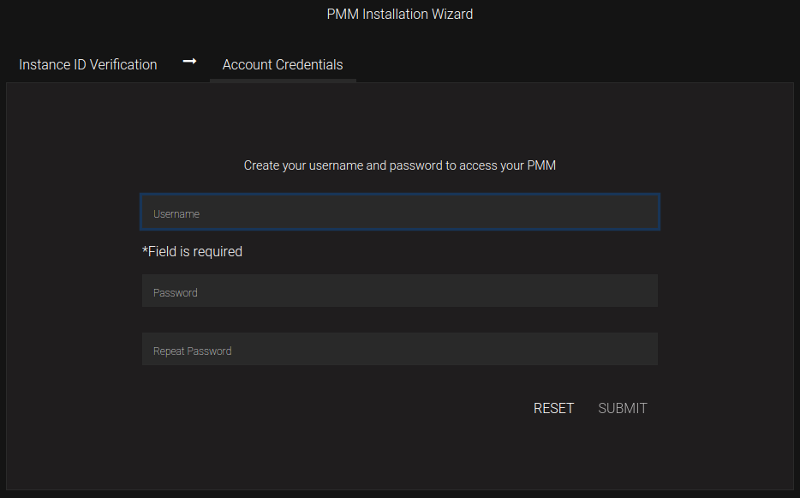 authentication as a user to PMM - this will be the credentials you need in order to log in to PMM. Accessing the instance by using an SSH client. Make sure to replace the user name ec2-user used in this document with admin. How to verify that the PMM Server is running properly? How to connect a PMM Client to the PMM Server? Your instance comes with a predefined size which can become a limitation. To make more disk space available to your instance, you need to increase the size of the EBS volume as needed and then your instance will reconfigure itself to use the new size. The procedure of resizing EBS volumes is described in the Amazon documentation: Modifying the Size, IOPS, or Type of an EBS Volume on Linux. After the EBS volume is updated, PMM Server instance will autodetect changes in approximately 5 minutes or less and will reconfigure itself for the updated conditions. Providing the public SSH key is optional. Specify it if you want SSH access to PMM Server. Upgrading to a larger EC2 instance class is supported by PMM provided you follow the instructions from the AWS manual. The PMM AMI image uses a distinct EBS volume for the PMM data volume which permits independent resize of the EC2 instance without impacting the EBS volume. Add a new disk via EC2 console or API, and expand the LVM volume to include the new disk volume. Expand existing EBS volume and grow the LVM volume. To expand the existing EBS volume in order to increase capacity, the following steps should be followed. Expand the disk from AWS Console/CLI to the desired capacity. Now we can use the lsblk command to see that our disk size has been identified by the kernel correctly, but LVM2 is not yet aware of the new size. We can use pvresize to make sure the PV device reflects the new size. Once pvresize is executed, we can see that the VG has the new free space available. Size of logical volume DataVG/ThinPool_tdata changed from 16.00 GiB (4096 extents) to 31.96 GiB (8183 extents). Logical volume DataVG/ThinPool_tdata successfully resized. Size of logical volume DataVG/DataLV changed from <12.80 GiB (3276 extents) to <31.80 GiB (8140 extents). Logical volume DataVG/DataLV successfully resized. We then expand the XFS filesystem to reflect the new size using xfs_growfs, and confirm the filesystem is accurate using the df command.